“Do not covet your ideas. Give away everything you know, and more will come back to you." 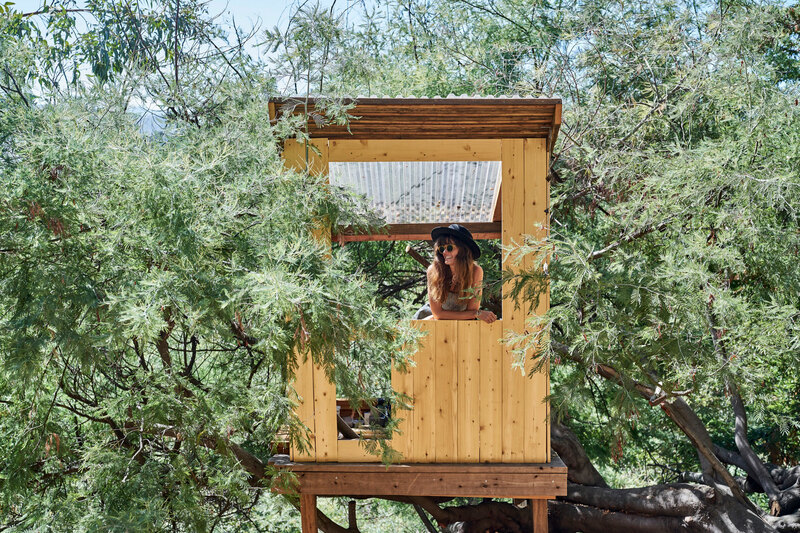 Raised in California and Utah, Kendra Smoot started her career as a prop and set stylist in New York before returning westward, where she now lives an hour north of California with her husband and three children. She has spent the last 15 years as a freelance stylist and today works alongside some of the most recognized companies in the country. At home with her among the rugged hillside, it goes without saying: yes, her home is an apt reflection of two decades as a professional aesthete, a serene and considered escape that is at once peaceful and a breath of inspiring air. Yet we've been most moved by Kendra's outlook on letting life lead with possibility — seeking challenge, keeping your eyes open, and being dedicated to surrounding yourself with things, people, and projects that support your values. As she explains, the most poignant ideas (and the deepest place of living) does not come from heads down staring at screens; rather it comes from the world and a receptiveness to seeing the unexpected. What themes or questions have been most emergent for you of late? What brings you alive? When do you feel the most awake to this feeling? Getting on a plane, pretty much every single time. The newness ahead, the break from routine, and the general unknown get me excited. I also love some good morning ambiance, like listening to classical music (mostly Bach), and getting some delicious candle or incense smells going. Eating dinner together ideally with a home cooked meal at the end of the day is very important to me, so I like to come up with a dinner plan early in the morning and get that out of the way and figured out. I love soups, sweating the chopped onions and celery at the beginning is one of the most delicious and comforting things I know. And then having a big pot of something to eat for dinner and lunches the next day feels very wholesome. Right now I love Tuscan white bean soup, Allison Roman’s spiced chickpea and turmeric soup, and this slow roasted tomato soup. I’ve always worked in collaboration with others and really enjoy that input and respect that comes in partnership. Lately I’ve been doing projects totally on my own — styling and photographing — and it’s been very helpful in recognizing my strengths and weaknesses. It’s super satisfying to get to creatively design a project from start to finish, but it's also humbling when I see that they aren’t always as good as I would have hoped them to turn out. I feel like the biggest part of my process is to stay curious: Always being open to learning more and from unexpected sources. What have been some unusual sources of inspiration for you as a stylist? All of the usual suspects like nature, art, travel, and books highly influence my creativity but as far as an unusual source...I’d have to say the mundane aspects of everyday are inspirational, or at least I like to try and figure out how to make all of the boring things a little bit better. For example, if I have to wait while one of my kids is at a sports practice maybe I’m at the side of the fields gathering weeds for a little car bouquet. Or figuring out how to convert my cleaning supplies from toxic chemicals to something safer and more visually pleasing so even cleaning is a more enjoyable experience. In what ways has your life surprised you? I’ve always been a "go with the flow" kind of person and I’m just so grateful with the flow I’ve followed! It’s way better than I ever could have imagined. I feel like our generation is incredible — I see so many women activated and trying their place and trying to make our world a better place every day. As a stylist who works frequently with objects and cultivating a space/mood can you share some specifics please? I’m partial to foraged materials. 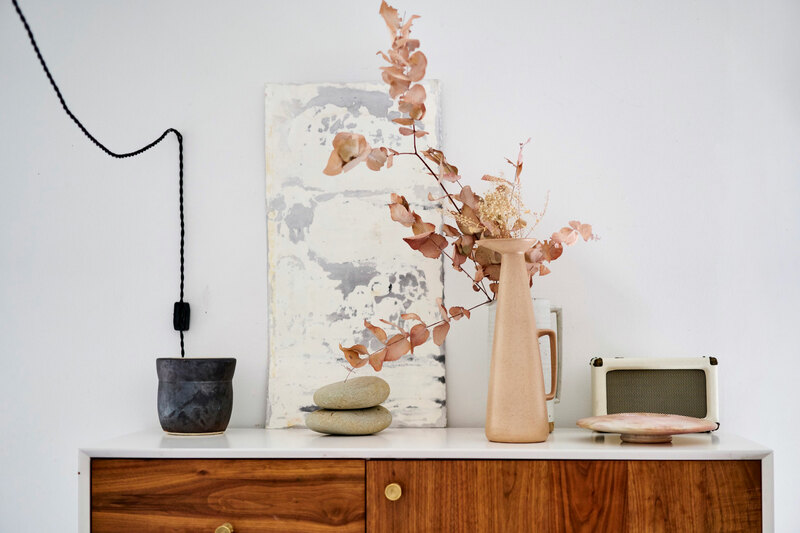 Not only is the foraging itself something that draws you closer to nature, but bringing that material into the home helps connect you to the season and what’s happening locally. Foraging also is more economical in terms of scale: I’d take a large sculptural branch or armful of weeds tucked in a vase over something imported or artificially grown any day of the week. Clustering objects to create little “shrines” of whatever you are into is always nice to create little moments of surprise and delight. 90% of my job as a stylist is to edit, to cut out the things you don’t like or that are bringing you down. Smokey, woodsy notes like palo santo or diptique feu de bois have been longstanding favorites. I also love this scent called carnal from the Australian brand AYU. I’m not sure I’ll be in NYC anytime soon and am afraid I won’t get to see the Hilma af Klint exhibit at the Guggenheim so I’d love to give and receive the book “Paintings for the Future." What practices most deeply ground you or make you feel “well” (however you define wellness or wellbeing)? I love dry-brushing, slathering on a good body oil (addicted to Everyday Oil at the moment), drinking tons of tea (PG Tips with a spoonful of Ashwagandha powder + milk or Superfeast Schizandra) but by far and away the thing that makes me feel the most whole is eating a plant-based, unprocessed diet.